Organic Sales: A small percentage of overall store sales are not organic. 100 percent of produce sales are organic, with a small amount of non-certified produce being from farmers using organic production practices while working towards organic certification. Chautauqua Natural Foods has actively avoided GMO products since the early 1990's. The store requires verification of non-GMO status for all products containing suspect ingredients. Peg contacts manufacturers through their website or by phone when she has questions or needs more information, such as when a product's ingredient(s) or labeling changes. She works with brokers who screen for GMOs such as Share Organics. Products brought into the store have been carefully screened and selected to meet the store’s health and wellness quality standards, with organic and non GMO being the store's primary purchasing priorities. Chautauqua also screens for good corporate citizenship. As giant multi-brand corporations have increasingly purchased independent providers, often their actions and investments do not support the store's organic principles. These products have been removed from store shelves. Chautauqua Natural Foods has for the past four years been actively removing and discarding products likely to contain GMO ingredients if found on their shelves. Last year the store removed all products labeled as "may contain GMOs" from their shelves and discontinued those products. Peg's belief, which she emphasizes to her employees, is that any loss of sales from GMO products are made up in for building Chautauqua Natural Foods reputation as a "Clean Natural Food Store." Chautauqua Natural Foods has large store signs informing customers about how GMOs are created, how to avoid them and the foods that have been modified, The store's GMO policy is also posted on a large sign. Products that are not organic are labeled with Non GMO signs. 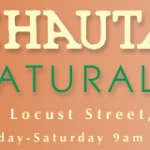 Chautauqua Natural Foods store is a Non-GMO Project Participating Retailer.